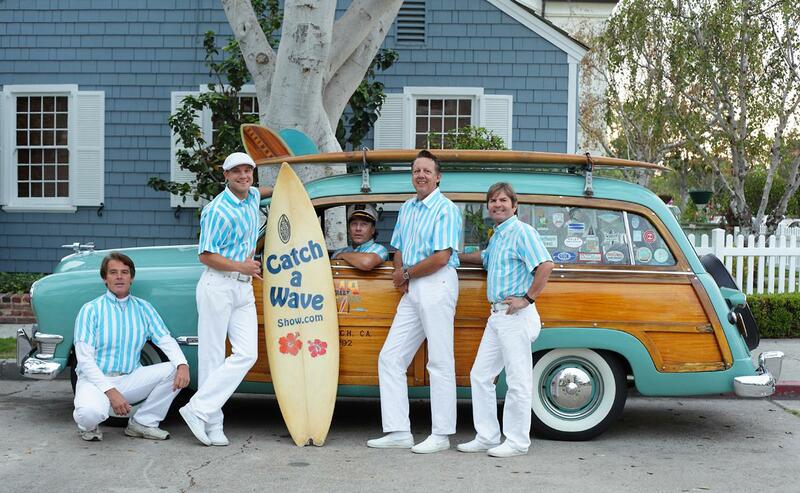 Catch a Wave recreates exactly the look and sound of a live Beach Boys concert, circa 1964-1969. PALMDALE – The City of Palmdale’s 2012 Starlight Concert Series continues with the surfin’ sounds of “Catch a Wave: A Tribute to the Beach Boys” at the Palmdale Amphitheater this Saturday, July 21 at 8 p.m.
Catch a Wave recreates exactly the look and sound of a live Beach Boys concert, circa 1964-1969, from their classic striped shirts to the unique and intricate 5-part harmonic vocals on greats like “I Get Around,” “Surfer Girl,” “Surfin’ USA,” “Help Me Rhonda,” “Good Vibrations” and “California Girl.” The sound of the show and the spirit of its members – Glenn Henry, Chris Hilliard, Gene Martin, Richard Gibson and Joel Dalton – bring the show to life. Catch A Wave has toured the U.S. and the world, performing to sell-out crowds in Japan, Holland, Jamaica, and Panama, and performs regularly at Disneyland and Disney’s California Adventure theme parks. Its members performed for Brian Wilson and the original Beach Boys’ families at the California State Historic Landmark Dedication of the home of the Beach Boys in Hawthorne, CA on May 20, 2005. Admission is $5 for age 13 and older; guests 12 and younger are admitted free, and parking is free. A season pass is available to Palmdale residents for $15, a savings of $10 for all five concerts, and $20 for non-residents, a savings of $5 for all five concerts. A limited number of VIP tickets are available for $10, which includes express entry and seating at the front of the stage, ensuring that VIP ticket holders can arrive just before the concert and still get one of the best seats in the house. VIP seating is theater style (first-come, first-served), with chairs provided courtesy of the Antelope Valley Mall. Guests 12 and younger will need to purchase a VIP ticket to be seated in the VIP area. Season passes, VIP and individual concert tickets are on sale now at the parks and recreation office, located at 38260 10th St. East, is open Monday through Thursday, 10 am to 6 pm, and accepts cash, check, Mastercard and Visa. Palmdale residents must bring proof of residency (California I.D., drivers license or current utility bill) to purchase a season pass at the resident fee. New this year, VIP and individual concert tickets can be purchased online at www.cityofpalmdale.org/starlight. For more information about the upcoming Starlight Concert Series, visit www.cityofpalmdale.org/starlight, www.facebook.com/StarlightConcertSeries, or call parks and recreation at 661-267-5611. 1 comment for "Catch a Wave plays the Beach Boys Best in Palmdale this Saturday"